A great place needs at least 10 reasons to go there, according to the nonprofit Project for Public Spaces. Does that count at the Polish Triangle  the intersection of Ashland, Division and Milwaukee? We're about to find out. The Metropolitan Planning Council, which five years ago studied East Village housing and development, will be keeping an eye on the Triangle for recommendations on improving the park and its surroundings. The Wicker Park & Bucktown Special Service Area, which finances street improvements in the area, is helping to organize the process, and the steering committee includes the CTA and other agencies with Polish Triangle development stakes. The Chicago Plan Commission last month approved development plans further north along Milwaukee Avenue in the Logan Square neighborhood. The Polish Triangle study will adopt the Project for Public Spaces' "Placemaking" method, which includes an evaluation workshop, a working group to sketch out a plan, a presentation of findings, short-term action and next-step plans. "Placemaking is a process of designing places around the way people use them and involve the community from the start," said Karin Sommer, project manager for the Metropolitan Planning Council. 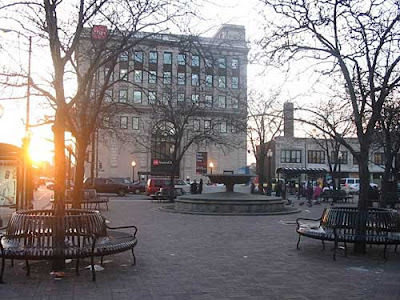 The Placemaking project's Chicago website uses Wicker Park as an example of the "power of 10" things to do in a place, from playing games to giving children an excursion to tourism to people watching. Next up in the Triangle project is a survey of "as many people as possible," Sommer said. She describes the project here. Meanwhile, city departments will be comparing notes, said Raymond Valadez, chief of staff for Ald. Manuel Flores. At least at the start, Valadez sees the process limited to the triangle park and the adjoining 1st Ward streets and sidewalks. The plan should take three to six months, he said. The planning council is sponsoring Placemaking studies in Chicago for the Polish Triangle and a still-undetermined spot in Pilsen on the Southwest Side. The Resurrection Project community development group is helping organize the Pilsen study. The two areas were among those identified in October workshops that included community groups and public agencies. The Polish Triangle's location as a CTA Blue Line transit stop was one factor in the choice, Sommer said. A Polish Triangle steering committee had its first meeting Jan. 13, led by Sommer and Jamie Simone of the Special Service Area. Scott Rappe, who chairs EVA's planning committee, was invited as a business and property owner. Flores requested that EVA be included in the process as a stakeholder, Rappe said. Last year EVA proposed transit-oriented criteria to develop the former Pizza Hut property across from the Triangle at the southwest corner of Division and Ashland. Since April, EVA has sought a ban on curb cuts for the Division-Ashland streets. Flores suggested the Polish Triangle study after the planning council briefed aldermen last year, Valadez said. In September, shortly after signing off on demolition of a nearby Commonwealth Edison substation, Flores floated the idea of marking the Polish Triangle as a landmark district. One goal of the project will be to line up improvement funds and other long-term strategies. "FIrst let's find out what the people want," Valadez said. Sommer contends that the Placemaking procedure doesn't have to have a lot of cash behind it to pay off. "You can start taking small, incremental steps that can add up," she said.